1: 1st quarter peal at first attempt. l to r: Chris Bush, John Mead, James Tye, Jane Ridgwell, Andrew Woolley, Ken Webb. First submitted Saturday, 7 July 2018 at 15:53:10 by Andrew K Woolley. 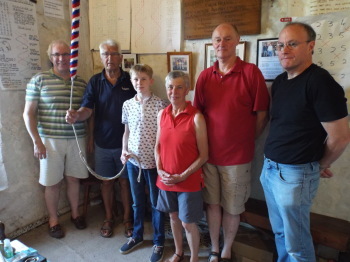 Sent for publication in The Ringing World on Saturday, 7 July 2018 at 17:57:17, and printed in issue 5595. This performance has been viewed 483 times.